Nothing satisfies a sweet tooth like a Goldy Schulz novel. She’s a crime fighter armed with killer blueberry-cream pie, chocolate glaze to die for, and vanilla buttercream frosting that will soften even the most hardened criminal. 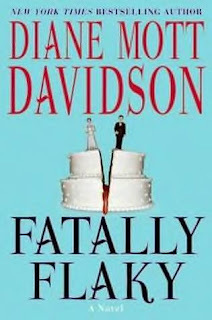 Fatally Flaky is number 15 in this series about the in’s and out’s of catering in the murder capital of the United States: Aspen Meadow, Colorado, and boy, does our highly caffeinated Goldy have her hands full! Apparently Aspen Meadow is a bit like the Hellmouth in Buffy the Vampire Slayer, but instead of supernatural activity being at its center, murderous behavior seems to gravitate to this location. What a real estate market they must have! This time around, instead of a string of dark and stormy nights, it’s been a long, rainy summer for Goldy Schulz. Doc Finn, a local beloved physician and dear friend of her godfather, has just been murdered. With a string of wedding receptions to cater, including one with Bridezilla herself, Goldy has never been busier. She doesn’t have time to solve this mystery, but when you’re the wife of the chief investigator of the Furman County Sheriff’s Department, and your godfather’s somehow gotten himself mixed up in the mess (much to his peril), what’s a blond, curly-headed sleuth to do? Break out the recipe book of course, and cook. As always, we are treated to a slew of straight from Martha Stewart’s vaulted library recipes, all made with unsalted butter, sea salt and “best-quality” ingredients. One of which I tried and will include at the end of this review. Apparently caterers eat very well. Having now read all 15 of these culinary mysteries, I generally rate each by two standards: how believable was the story and did any of the recipes look interesting. This one was not my favorite of the series, but was just interesting enough to finish. The plot line was predictable, but well written. There are very few surprises in this one. I knew well in advance what was going to happen. Perhaps Davidson tried to stir things up by introducing a main character in Goldy’s life that I think would’ve been mentioned by now, like in book 2, and some of the characters names? Billie Attenborough? Doesn’t really roll off the tongue does it. I think she ran out of good names by book 6. Aside from that, as always, there’s a great cast of returning characters. Her sixteen-year-old lanky son Arch is learning to drive, and her swimmingly handsome, vegetarian assistant Julian is back from college again. Goldy’s good friend and sisterly ex-wife to the Jerk, Marla, as usual has all the best lines, but I would’ve liked it better if Goldy’s husband Tom, a character I enjoy immensely, was more involved in the story line. Now, on to the superbly named recipes. Hmm. Usually there are at least one or two, maybe more that I would actually make, but this time most were too…how can I put this…off-the-charts hard. Who would really make these recipes? Enough with the nuts and bits of candied fruit! Seriously, they’re only good together at Christmas time. We know you like them. Time to add other ingredients to your cakes, cookies, and breads. I did try the Fatally Flaky Ice Cream Cookies. See my slummed up version below, sans the sea salt, pure vanilla, best quality cocoa and real vanilla ice cream, and of course, unsalted butter. (My butter is plenty salted thank you very much!) These little chocolate numbers were tricky and not much to look at, but pretty dang good. Beware if you use the recipes in these books. Be prepared to have bits of oats and brown sugar fall out from the pages if you choose to reread it again. Unfortunately, I probably won’t have that problem with this one. 3 stars. Preheat oven to 350. Melt butter in a pan over low heat. Add sugar. Stir until mixture bubbles, about 3-5 minutes. Remove from heat and let it cool while you mix the other ingredients. In large bowl, combine cocoa, oats, flour, baking powder, and salt. In another bowl beat together the egg and vanilla. Add to oat mixture and then add the cooled butter mixture. Stir well. Using a 1-tablespoon ice-cream scoop, measure out the batter onto cookie sheets. Bake 10-12 minutes or until cookies are completely cooked. Allow to cool on the sheet for 5 minutes, then carefully transfer to cooling racks. Layer with ice cream or vanilla frosting. Makes about a dozen sandwiched cookies. Yum Yum! Please bring a batch of Fatally Flaky Peasant Cookies to Liz's pool party on Sunday. We'll supply the burgers and homemade ice cream. Ah, man, you have a pool? Damn this region 5 climate I live in!